The verb translated “fan into flame” in 2 Timothy 1:6 is unique in the Greek New Testament. 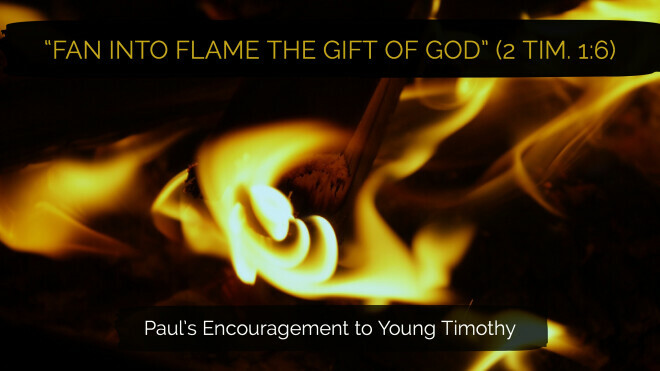 The full phrase is somewhat startling as Paul calls Timothy “to fan into flame the gift of God.” One commentator suggests that “Timothy might be in a state of athumia [discouragement].” If so, is Paul anxious about the possibility of Timothy wilting in his ministry duties at Ephesus? Or, does Paul have something else in mind with these words?Let’s take a closer look at this phrase and see if we can discover what Paul is saying to his “beloved son” (1:2).